if it falls on the floor, it’s mine! I often joke about our dogs in the kitchen. Either their counter-surfing antics in the kitchen or their sneaky stealth of cookies and pumpkin bread off a cooling rack. I add humor about Tiamo eating and then hiding the cream carton or the butter dish. I laugh about Dolce doing a “drive-by” in the kitchen, searching for crumbs and tasty treats. I jest about cooking and nibbles that fall to the floor. As my cookbook title states, If it falls on the floor, all bets are off and it’s theirs! My previous blog postings cite humorous and funny stories of Tiamo, Dolce and Amore fighting over food scraps. 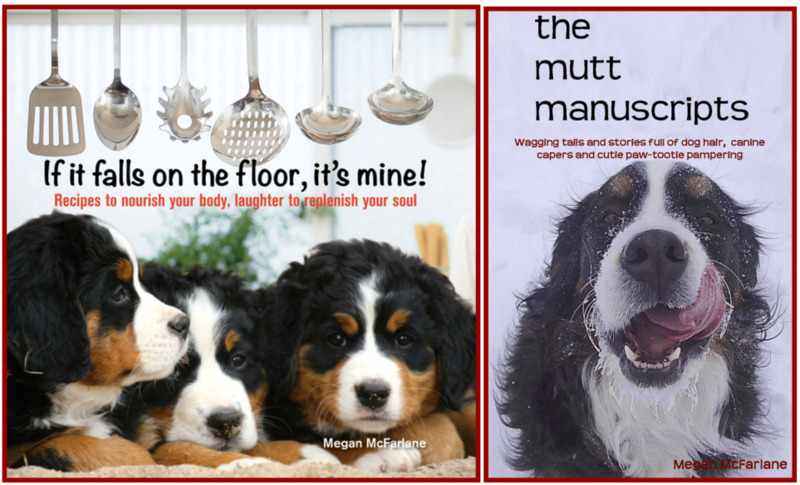 I write about our life with three 100 pound Bernese Mountain dogs and attempt to inject humor, entertaining the reader. But, on a serious note, there are many foods that are detrimental to a dog’s health and life. I devote a whole page in the front of my cookbook on foods that should never, ever be given to your dog. Today I want to emphasis the many foods canine need to avoid. I’m serious here! Please be careful when you allow your precious pets in the kitchen. With all the tasty treats we receive over the holidays from friends and family, it’s easy to leave something out on the counter, within easy grasp of a greedy muzzle. Dogs believe in the two second rule. You have less than two seconds (more like a nano-second) to recover anything that drops to the floor. Once a dog has fixated on that treat, there is no stopping’em! The smells, odors and scents of these treats are tantalizing to them. In spades. Have pity on our canine friends and remove the temptation. You have my permission to re-post, and/or copy and paste the chart below. I’m serious. Pass it on!